Oftentimes when you return for a scheduled checkup, your dentist will routinely check what restorations may be needed. With your fingers crossed, you hope to hear those magic words: "No problems. We'll see you at your next checkup." With a sigh of relief, you've made it through another dental appointment. On the other hand you might also hear, "You need to return for some new or replacement fillings" or "A crown is needed on your tooth" - words you prayed you wouldn't hear. You might think, "What exactly is a dental crown, and why do I need one"? Dental crowns, sometimes called dental caps, are tooth coverings constructed of porcelain, porcelain-fused to metal or all-metal materials. A crown looks exactly like a tooth and usually covers the entire visible tooth surface to add strength and durability. As we age, a tooth can often create small cracks, especially in our back molar areas, which can weaken the tooth structure. Sharp pain will usually tell you if you have this problem. Though age can be a factor in wearing down or cracking a tooth, chewing patterns, grinding, tooth decay and root canals are also contributing factors. For some people who have misshapen or severely discolored teeth, a crown is the only way to improve their cosmetic appearance. Often that movie-star smile you see on television that you wish you had is really all replacement crowns/caps (although they can also be veneers, which are different from a crown and which we will discuss in a future column). 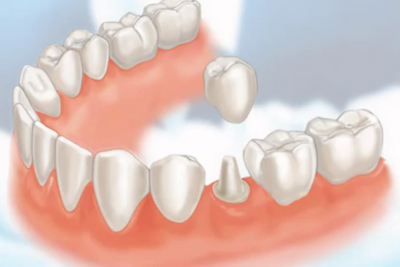 For individuals who have a missing tooth, a dental implant crown or bridge may be required to correct the problem. In cases where larger fillings in teeth have eventually weakened the tooth structure, we also place a crown on that tooth. Prior to a crown, your dentist checks your tooth and looks at your X-ray to be sure the root and surrounding bone are healthy. If the tooth has extensive decay, if there is a high risk for an infection or if there will be injury of the tooth's pulp, a root canal may be recommended. I usually inform my patients to monitor the tooth for discomfort to pressure, as well as hot and cold sensitivity. When you have these symptoms, inform your dentist so he can determine whether it is temporary or irreversible and if a root canal is recommended. Crowns usually require two visits. The first is the longer appointment, where the tooth receiving the crown is filed down - called a "crown prep" - on the chewing surface and sides. It's not as bad as it sounds. Tooth impression molds are then taken and sent out to a dental lab for your crown's fabrication. You will receive a temporary crown on your first visit to protect the prepared tooth until you receive the permanent crown. The turnaround time to receive your permanent crown is generally two to three weeks. The second visit is shorter because you may or may not require local anesthetic. This depends on your sensitivity and whether the tooth has had a root canal or not. The temporary crown is removed and the permanent crown checked for fit and color. Your dentist also will check to be sure there is good contact between your teeth so that it doesn't become a food trap. Your dentist will check that the crown is sealed properly. Bite adjustments are also done. On rare occasions, the patient may need to return for a third visit to have an adjustment on the new crown or because the patient received a local anesthetic at the delivery visit. With the advancements in dentistry, you may have an office like mine that provides the "one-visit" crown appointment. The foremost company in this technology is Cerec. It is known as the "Computer-assisted design - computer-assisted manufacture" crown, or CAD-CAM. This type of crown is milled by a computer to fit your tooth precisely while you wait. This eliminates the laboratory step, as well as the need for a second appointment and temporary crown. These Cerec crowns are milled out of pure ceramic. For more information, ask your dentist. On the average, dental crowns last five to 15 years. Costs can vary depending on the type of crown selected and the geographical area. Costs can vary from $700 to $1,700. The lifespan of a crown depends on the amount of wear and tear the crown is exposed to and the material used. Be careful not to shorten the lifespan of your crown. Mouth-related habits that damage your teeth - aside from clenching or grinding - include using your teeth to open packaging, biting your fingernails and chewing ice. Be careful and protect that beautiful smile.